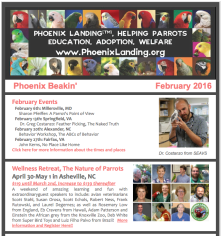 ﻿Phoenix Landing﻿ is a 501(c)(3) all-volunteer organization dedicated to the welfare of parrots. - advocate standards of care for birds. ​Each level has its own benefits, and all memberships include a 2016 calendar and tax donation. Join anytime of the year, benefits good for one year thereafter. 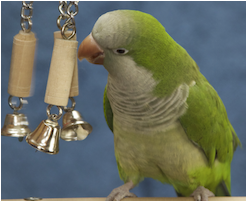 ​Your support helps the many parrots of Phoenix Landing! 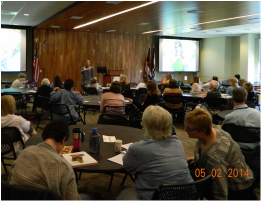 Every 2 years we host a national conference at the University of North Carolina-Asheville. We host events in Virginia, Maryland and North Carolina. There is always something new to learn, and our birds will benefit from our dedication to improving their lives. Most birds need a succession of good homes, especially those with a potential long life span. Consider adoption first! Shop with us to help support our education and adoption programs. We greatly appreciate your support! 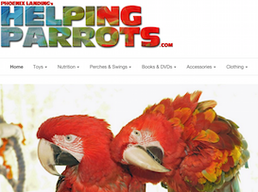 Our store carries parrot toys, perches, food and other supplies. ﻿Shopping on Amazon?﻿ Using our AFFILIATE button really helps! (It is much better than Amazon Smile). Click on the icon to get started. Use the African Grey Logo to make a one time much appreciated tax deductible donation. 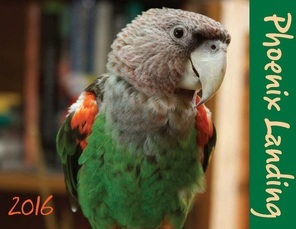 Or consider a monthly pledge of $10, $25 or $50 by subscribing underneath the quaker, cockatoo and macaw logos. Thanks for helping the parrots of Phoenix Landing! Join us for 3 action packed days of training, talk and fun. Our objective will be to see the endemic blue-throat macaws and the red-front macaws. We will be visiting three distinct regions of Bolivia in order to see as diverse snapshot of their parrots and wildlife. It will start out by exploring the dry Andean foothills where the Red-fronted Macaws thrive, then we’ll move into the dense Amazon rainforest to a remote lodge owned and operated by a native Indian tribe that greenwing macaws call home. We’ll then move onto the tropical savannahs where we open to glimpse the endangered blue-throat macaw. It is our first time visiting Bolivia and we hope you’ll join us on this adventure. Included in this cost are accommodations for 10 nights, most meals, personal English-speaking guide, all tours, guides and internal transportation/flights while in Bolivia. Minimum group size is 6 and max is 10 so it will be an intimate, tailored trip for us parrot lovers. Our fourth ecotour to Brazil will include some favorites as well as some new destinations. After landing in Sau Paulo, we'll fly on to Campo Grande where we will spend time with Neiva Guedes, the scientist that led the effort to preserve the hyacinth macaw. Next we will head to Buracas das Arara (the "hole of the macaws") where we will see greenwing macaws in great numbers. Our next destination is the Barra Mansa Lodge where there is a reported abundance of wildlife, to include parrots. Luiz, our much appreciated guide, says this is one of his favorite spots. Our last stop will be Baia das Pedras, a lodge in the outer reach of the Patanal where you can rest in a hammock while parrots shear off mangos in the tree above you, or take a hike to watch the hyacinths nest or drink in the marshes. Wildlife in this part of the Patanal has remained completely natural and without human interference - a beautiful sight to see. 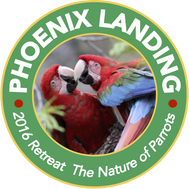 Watching parrots in a totally natural habitat is unforgettable, and we hope you will join us. Due to lodge limitations, this trip will be limited to 10 people. 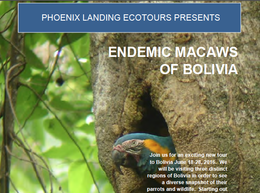 If you are interested in our Brazilian ecotour, contact ann@phoenixalnding.org for more information. What will happen to your bird in the future? Click here about some things you might consider. 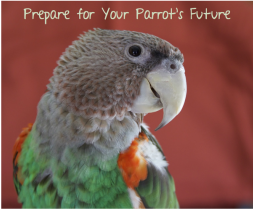 Prepare for your parrot's future!